“Nicastro” is one of the most well-known family names in Ottawa, and a widely-known and loved grocer. The Merivale location has been a local favourite for decades, catering to customers from every region. Specializing in fine foods, delicatessen, cheeses and more, Nicastro Fine Foods is your #1 supplier in quality Italian and imported products. The Merivale location has been managed by the Nicastro brothers for over 30 years. 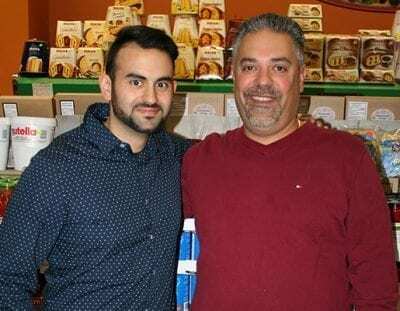 Brought together by their love of good food and building business, Frank Germano and Sam Chiarello took on the management of Nicastro Fine Foods in November 2017. Frank and Sam bring to the table a wealth of knowledge of the food industry, and are driven by their passion to satisfy clients by offering exciting new products, and a shopping experience that will keep you coming back for more. At Nicastro’s we pride ourselves with having one of the best selections of Italian and other Gourmet foods in Canada. Here are just a few of our trusted specialty brands. Visit our store to see these & so much more. Are you interested in learning more about our catering service?